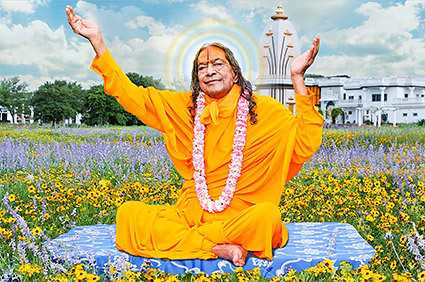 After leaving Indore at 16, Kripalu Maharaj retreated into the dense jungles of Chitakroot and there repeatedly entered the highest state of ecstasy of Divine love. After word spread of this individual who laughed freely, and swayed and danced in ecstasy while uttering ‘Krishna, Krishna,’ people took to calling him Paramhansji, in honor of his persistent Raha Krishna love, which in Sanskrit is called Mahkrya Bhao Bhakti. He would remain in this state for days on end, and those lucky enough to encounter his presence during this time were blessed with witnessing one of the most sublime levels of spiritual rapture known to humanity. He remained in this state and lived in the nearby jungles for nearly two years. In 1940, Kripalu Maharaj came to Vrindavan and began visiting the houses of his devotees for satsang, the sitting meditation. At this time, he also travelled to the houses in Agra, Mathura and Allahabad, and he began to honor requests by his followers to speak on the philosophy of Bhakti. Word spread quickly about the young saint who was wholly devoted to God’s love and who radiated divine consciousness of the highest love, and people began to seek him out and invite him to visit their homes that they might experience this love directly and participate in the divine consciousness through his presence, and become more holy and more enlightened themselves. It was common for him to be so enraptured that he lost all awareness of his surroundings and was totally oblivious to the passage of time and the need for food and water. People took care to feed him and to clothe him and offer him shelter in their homes. In these all consuming ecstatic states, it was common for him to simply get up and go from one home to another, or from one village or town without regard for what he was wearing or how long he had been in any one place. These actions permitted many people to express kindness and compassion for him and to witness firsthand the manifestation of all-loving divine consciousness, the state known in Sanskrit as Samadhi. Being so totally absorbed in divine ecstasy of the Radha Bhao made it to communicate directly with others or to discourse on the nature of Bhakti, so he graciously agreed to temper his ecstatic state somewhat and to accept the invitation of his devotees to come into their homes and to lead sessions of satsang, (silent, sitting meditation), and sankirtan (chanting). At this time, in addition to the satsang and sankirtan, he began to sing the leela pad, which describes the loving history of Radha and Krishna. These sessions of sankirtan involved ecstatic chanting of Hare Ram, and, during moments of extreme ecstasy Hare Bol. Historically, these states of Radha Krishna were first revealed by Chaitanya Mahaprabhuji some 5,000 years ago. These sessions of satsang and sankirtan evolved to the point where, in 1942, Kripalu Maharaj returned to Mahu and began to hold prolonged sessions of sankirtan that regularly stretched on for days and even weeks. One session that was scheduled for two weeks ended up stretching into four months.